Lymphedema is a disfiguring condition that adds insult to injury for up to a quarter of women who survive breast cancer. 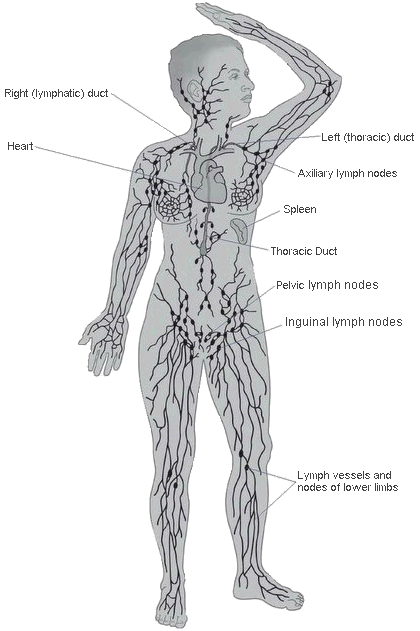 Damage to the body’s lymphatic system can change the way lymph fluid moves from arms and legs to the core of our body. There are many causes of lymphedema; secondary lymphedema occurs after an assault on the lymphatic system resulting from lymph node removal or damage during surgery, chemo & radiation but can also occur in the legs after surgery near the groin, post trauma from accidents, injuries, & other non cancer surgeries. Obesity & prolonged edema from other causes such as heart failure can also trigger lymphedema. The result is a swollen, heavy limb and an immune system that can’t do its job. Primary lymphedema is less common but can occur at any stage in life from birth through to mid 50’s, a common age of onset. It is caused by a genetic predisposition that can be triggered by a trauma. Estimates from Canadian sources indicate that approximately 1 million Canadians have the incurable disease, many unaware of the true cause of their swelling which is often misinterpreted as fat. “There are a lot of things that a person, especially cancer survivors could do to ensure that the lymphedema (LE) is delayed or the severity is reduced. The goal of the BC Lymphedema Association BCLA) is to provide information & support for those newly diagnosed, uncertain about what is happening to them and where to turn for help. The majority of the medical profession know very little about lymphedma or how to treat it. BCLA is a resource to help patients find therapist, fitters, and suppliers & learn more about how to manage their condition. Lymphedema is a medical condition where protein-rich fluid known as lymph collects typically in the arms or legs resulting in pain, decreased mobility, recurrent soft tissue infections and permanent disability. Lymphedema appears in two forms, a categorization based on its etiology, either primary or secondary. Congenital lymphedema is an in-born abnormality where lymphatic channels and/or their nodal basin in the axilla or groin regions fail to develop normally. This congenital condition is also known as “primary lymphedema” and commonly presents in infancy. Primary congenital lymphedema typically affects only one limb and should not be confused with lipedema that symmetrically affects bilateral limbs. Congenital lymphedema that presents in teenage years is known as lymphedema praecox and as lymphedema tarda when presenting as an adult. These disorders must be examined closely as they may indicate the presence of a cancerous process with compression of the lymphatic system versus a congenital disorder. Secondary lymphedema is a medical condition where damage occurs to the lymphatic system. The most common injury is surgical, whereby lymph nodes are removed for the treatment for a variety of cancers. To further complicate the situation, many of these patients undergo irradiation therapy that can worsen the condition. Conventional treatment for lymphedema includes manual lymphatic massage and the use of compression bandages and garments. This approach is designed to minimize the accumulation of lymphatic fluid within the soft tissue of the affected limb. Uncontrolled collections of lymphedema fluid can be painful and can be a set up for recurrent soft tissue infections. Profound, chronic lymphedema, commonly referred to as elephantiasis, can result in open, non-healing ulcers and a woody appearance of extremity skin, the effects of which are irreversible.